Tell us more about Ideocean Holdings. Ideocean services the marine, offshore, cruise, port and logistics industries and is driven by the vision of bringing together knowledge and capabilities to deliver solutions to our client base in these markets. We offer maritime management consulting, venture development, education and business development services. Singapore is a leading maritime services cluster and one of the best location in the world to live and work. To establish ourselves as a leading maritime services business in the region. I was referred to Rikvin from Mr. Manoj Gairola of Vigam Enterprises. I found the Rikvin to be very efficient. I would particularly like to recognize Ms. Kate of Rikvin’s Immigration Services Team for her professional approach and informed service. 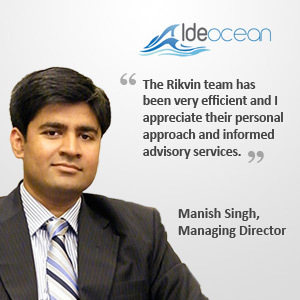 I have also consulted with Rikvin on multiple occasions, and will continue to engage them in multiple service areas. As such, I definitely look forward to maintaining a lasting and mutually beneficial relationship.